Just recently Olde Good Things joined 1stdibs.com to be one their ‘World Class Dealers’. 1stdibs was founded in 2001 by Michael Bruno after visiting Paris flea markets. Today 1stdibs is the go to source for the world’s leading interior designers and in-the-know consumers to find antiques, design, estate jewelry, vintage fashion and art. Its headquarters is in New York City. 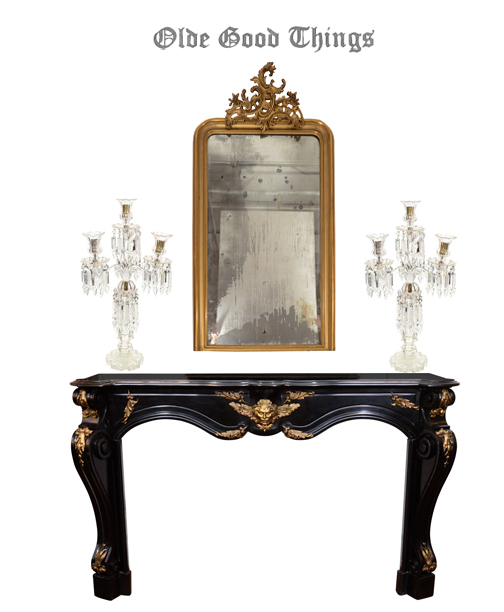 Some of our finest pieces are featured, including Black French Marble Mantel and Belgian Gilt Mirror seen below. There are now over forty pieces online and growing. Visit the Olde Good Things 1stdibs store.